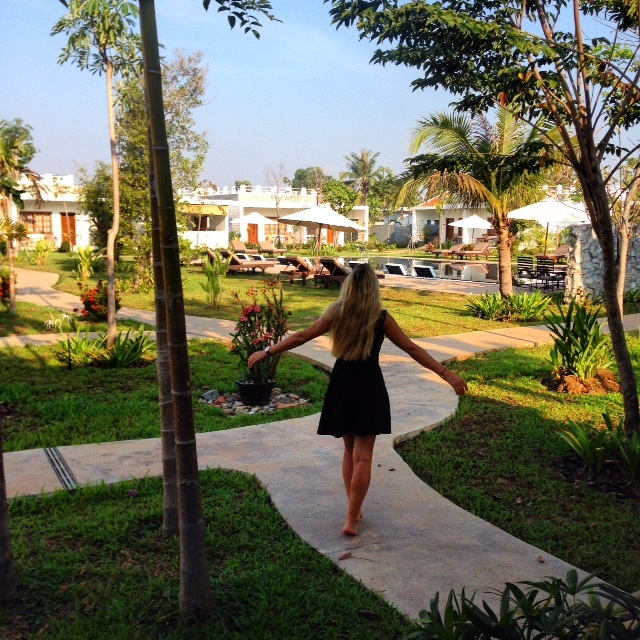 After a few busy days in Cambodians Capital Phnom Penh, the Trésor D’Angkor Villas & Resort feels like Paradise! The Resort is about 2 km outside of Siem Reap, which makes it perfect. We are staying in the pure nature with beautiful butterflys, away from the noisy city. 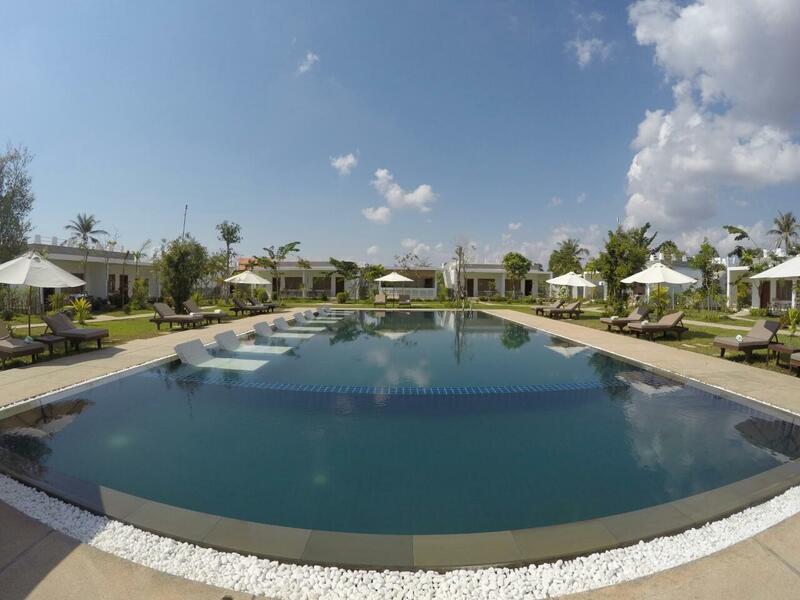 The Trésor D’Angkor Villas & Resort has 9 Villas with 18 rooms. 2 Rooms have a private pool. In the middle of the resort is a beautiful garden with a saltwater pool. Around the pool are many relax chairs with comfortable matrices and sun umbrellas and 8 relax chairs inside the nice pool. The beautiful furnished lobby is surrounded by a nice little lake with fishes inside. That means there are almost no Mosquitos, jippii 🙂 When we arrived, the staff welcomed us very friendly and we got a delicious welcome drink and a cold towel. 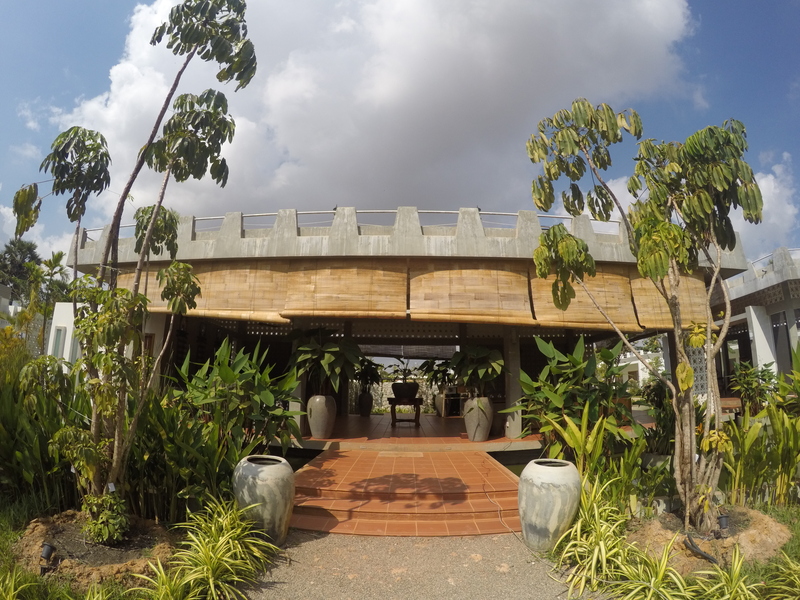 Next to the lobby is the restaurant, where the guests enjoy a very tasty breakfast buffet and optional lunch and dinner. The breakfast buffet of the Trésor D’Angkor Villas & Resort consists of 2 warm dishes, like fried rice and Cambodian noodles, which changes every day. Then they have a variety of fresh fruits, different kinds of bread and croissants, cereals, marmalade, etc. Besides that everybody can choose a dish out of a breakfast menu. We enjoyed the breakfast a lot, it was very delicious! The coffee and the variety of tea is very very good in the restaurant of the Trésor D’Angkor Villas & Resort. The Sunset Lounge, which is on the roof top of the lobby, is the perfect spot to have a drink and watch the sunset in the late afternoon. The modern architecture of the villas and the whole resort is amazing, I really love this style. 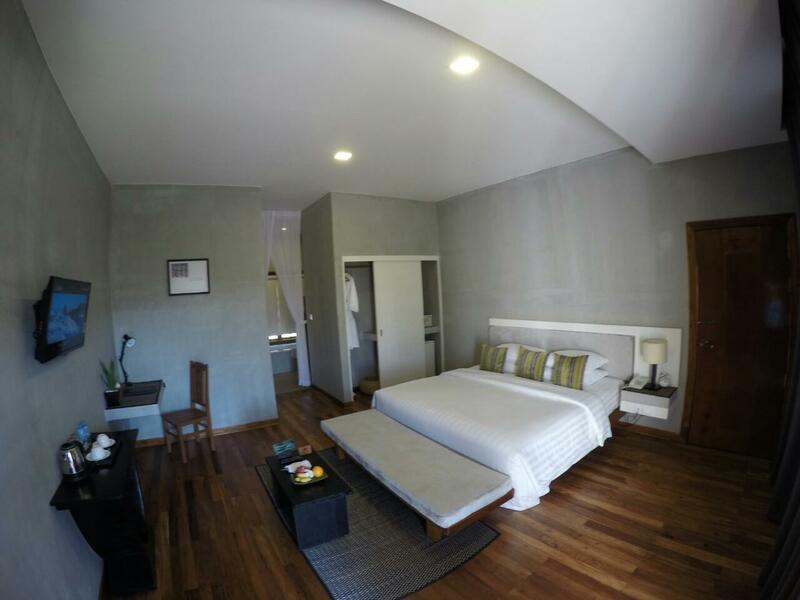 The rooms are huge and very comfortable. They are furnished with a king size bed, a bench in front of it to sit on, a coffee table and a TV. Every room has a desk as well. In the room are tea and coffee-making facilities and complimentary water. The room is divided from the huge bathroom by a curtain. The bathroom provides a very nice shower and a bathtube and you have a lot of space. I loved taking a bath and relaxing there. 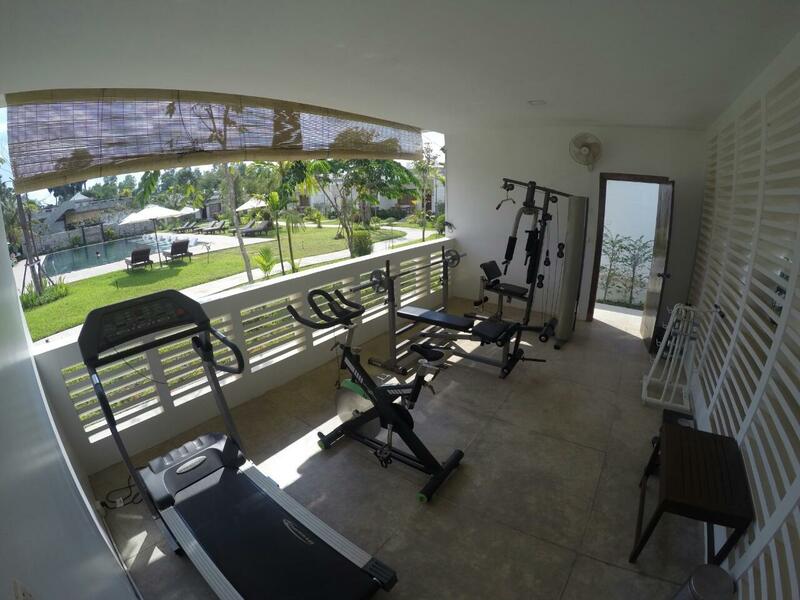 They have a gym with garden with a great pool view as well. We didn’t do sports, but it is definitely nice to have, if you are staying a little longer. Everything seems to be brand new and nice. 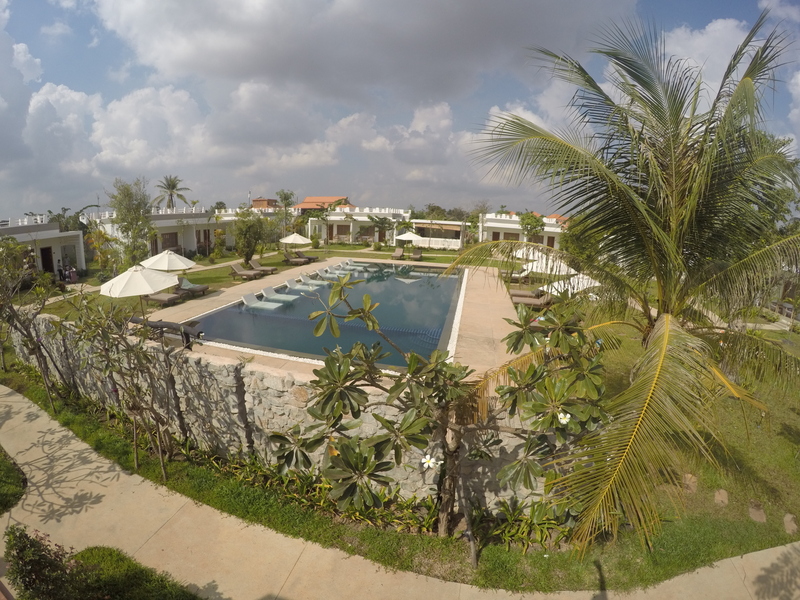 The resort offers their hotel guests to use really nice mountain bikes, to bike around Siem Reap and explore the city by yourself. We haven’t had enough time, but we wanted to do it. I think this is a great opportunity to see a lot. They have a shuttle service to the Town as well. This offer is really great. The lovely drivers brought us to the night market and picked us up at a settled time. The staff is so friendly and helpful. We love the Cambodian locals, they are very good people. The Trésor D’Angkor was opened one year ago and it is a magical place for me. I will definitely come back soon. 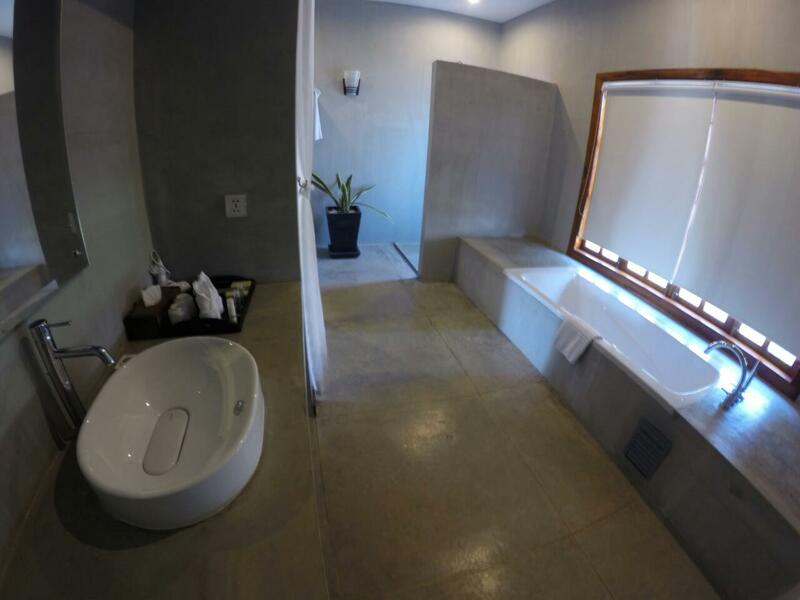 This is the perfect place to spend a few relaxed days or weeks, to celebrate a anniversary or your honeymoon.